We have not been exactly overrun with recordings of this composer’s music for choir and orchestra - still less his music for the church. For this and other reasons this disc, arriving as part of Sterling’s rather special Raff series (CDS1085-2 ~ CDS1089-2 ~ CDS1075-2), is multiply welcome. The first two works are for voices and orchestra while the last six are a cappella. We launch with a stirringly regal Te Deum in three segments: a clamorous and forthright Te Deum laudamus, a romantic and all-but Tchaikovskian Te Ergo and a gloriously exciting In Te Domine speravi. It’s compact and enjoyably theatrical. Played to an innocent ear audience I wonder how many would guess this was the work of Raff. This is followed by a seriously symphonic length De Profundis. It has an emotion-stilling orchestral introduction which is followed by five meaty choral episodes. The writing sounds weightily Brahmsian yet manages serenity also. The mood is suitably grave yet lightened by many well calculated orchestral touches like the pizzicato near the start of Si inquitates and the jaunty fanfares that open the fugal finale, Et ipse rediment. Susanna Andersson can be heard in the serenely ambling Quia apud te - she is a devoted advocate for this Mozartian music, if a little tremulous. 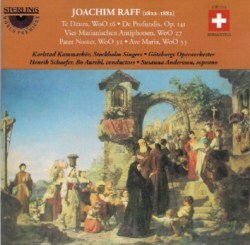 Those who have a taste for Brahms’ German Requiem should try this for a change. It’s by no means the same but is in the same mood territory. Only in the Allegro finale is the spell broken with a joyously active celebration. Raff knows how to end proceedings in grandeur. One can see here part of the mulch from which Schmidt’s much later Book of the Seven Seals sprang. The a cappella Pater Noster, Ave Maria and Vier Marianischen Antiphonen are all prayerfully impassioned and are redolent of the devotional music of earlier times - Raff connecting with roots in the 16th and 17th centuries. The final Salve Regina - the last of the Marian Antiphons - is quite delightful. The orchestra gains an emphasis at times at the expense of the choir which at various times I suspect could, with advantage, have been larger. There were no such thoughts when it came to the purely choral works. The disc is completed by a 32 page booklet stuffed to the edges with useful and readable English-only notes by Dr Avrohom Leichtling. Thus another portal is opened on Raff’s dust-covered heritage to show us that he is not to be celebrated merely as the orchestrator of the Liszt tone poems and the writer of eleven symphonies (Tudor; Marco Polo). For more about Raff don’t miss Mark Thomas’s Raff website and the invaluable Joachim Raff Society where I learn that Sterling has recently completed sessions for the final salvo in the series. It will involve a double CD of orchestral music including Raff's orchestration and arrangement of Liszt's Prometheus Unbound overture, the intermezzi from the Welt-Ende oratorio and a reconstruction of the incidental music to Bernhard von Weimar. Henrik Schaefer will again conduct the Gothenburg Opera Orchestra.